The 2018 Ford Expedition is a completely redesigned SUV with an all-new aluminum body and a high-tech interior that you'll love to spend time in! Taking your drive from boring to exciting, the 2018 Ford Expedition is packed with high-tech features and lighter bodywork than ever before. Rugged and stylish, the 2018 Ford Expedition is an off-road capable, family-friendly SUV! The 2018 Ford Expedition is loaded with infotainment features your whole family will love, including entertainment display and plenty of gadget-charging stations. Read on below to learn more about the exciting 2018 Ford Expedition! The 2018 Ford Expedition comes standard with an updated version of Ford's 3.5-liter EcoBoost V6 engine, providing more power and giving the 2018 Ford Expedition a boost of driving energy! The 3.5-liter engine is paired with a ten-speed transmission designed to improve mileage. Rear-wheel drive comes standard, but four-wheel drive is available. Also available is Ford's all-new Terrain Management System. The Terrain Management System lets the driver decide between drive modes for optimal handling in inclement weather. The system also enhances fuel economy and improves towing capacity. The 2018 Ford Expedition is an exciting SUV, perfect for anyone who wants power, storage and off-road capabilities! 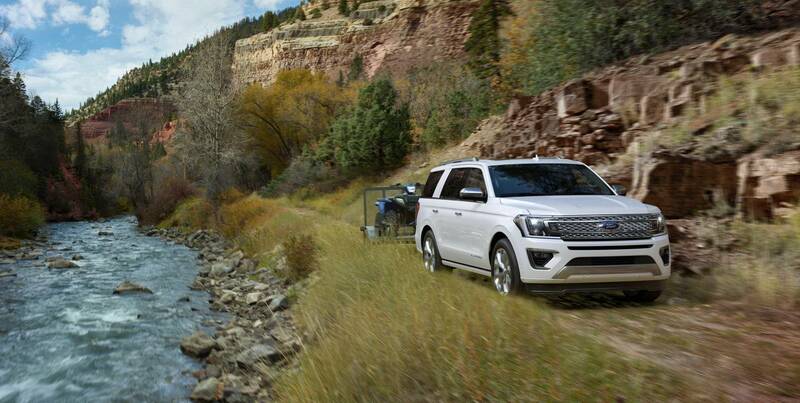 The 2018 Ford Expedition is available in three trim levels; the Ford Expedition XLT, the Ford Expedition Limited, and the Ford Expedition Platinum; each with unique features. There are three rows of seating, each offering charging for personal devices, with four 12-volt outlets, six USB ports and a household-style 110-volt outlet available. The Sync3 user interface integrates Apple CarPlay and Android Auto, and offers SyncConnect, a service that allows owners to remotely start and lock their vehicle, while also providing diagnostic information through a smartphone app. A Wi-Fi spot lets you connect up-to ten devices, and the dual headrest screens are set up for rear-seat entertainment. Charge your gadgets on the wireless charging pad, a new offering for the 2018 Ford Expedition, and listen to your favorite tunes on the 12-speaker audio system! The large interior cabin of the 2018 Ford Expedition provides lots of room for passengers, even in the third row, which seats two adults comfortably. The rear seats fold flat, offering plenty of cargo room, though there is an extended-wheelbase version that will add even more cargo space for those with heavy hauls. You can take the 2018 Ford Expedition off-road with the optional electronic limited-slip differential found on four-wheel drive models. The redesigned body is made of aluminum, managing to cut down on the weight of the vehicle by a full 300 pounds! Ford didn't sacrifice a roomy interior for a lower-roof line though, the interior is just as large, and even taller passengers will find they have enough headroom! With any configuration you choose, the 2018 Ford Expedition provides excellent passenger space, plenty of high-tech functions, and intuitive handling! Does the 2018 Ford Expedition offer charging outlets for my technological devices? Does it ever! There are four 12-volt outlets, six USB ports and a household style 110-volt outlet, in addition to the integrated smartphone system that lets you drive safely with hands-free technology! Can I get my 2018 Ford Expedition serviced at Sheridan Ford? Yes, you can! Our dedicated staff of knowledgeable Service Experts are happy to help service your vehicle! Click HERE to schedule a service! Do you offer any special discounts for military members? Yes, we do! As a thank you for your service we offer a special Military Bonus! Click HERE to learn more about our military bonus! It may be hard to believe that the 2018 Ford Expedition could fit any other features into its newly redesigned aluminum body, but Ford was able to pack the 2018 Ford Expedition with safety and security features! Driver-assist technologies like a 360-degree camera system and active park assist help you maneuver the 2018 Ford Expedition, while adaptive cruise control, lane keeping assist and blind-spot monitoring work to keep you safe! 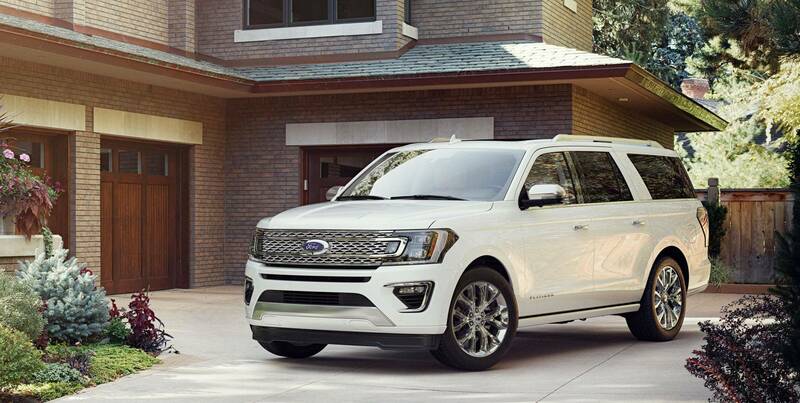 The 2018 Ford Expedition provides power, substance and style in a family-friendly vehicle you'll truly enjoy driving! Come by our convenient Wilmington, DE location and take the 2018 Ford Expedition for a test drive today!